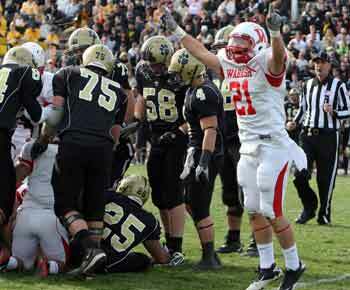 The Wabash College football coaches weren't certain where junior Andrew Gibson would play when they recruited him. One could argue they are still unsure. Gibson will play wide receiver this season after starting at safety last year for the Little Giants. He joins a receiving corps that graduated three starters from last season. Gibson played receiver his freshman year for the Red Squad team before moving to safety in 2011, eventually becoming a starter. He attended Mooresville High School outside of Indianapolis where he started at quarterback and safety his senior year after playing receiver as a junior. While coaches were trying to figure out where to play Gibson, he was trying to figure out if he wanted to play college football. Gibson is planning to be a psychology major with a double minor in biology and chemistry. He wants to attend Indiana University Medical School and become an M.D. after he graduates from Wabash. He wrestled in addition to playing football his senior year and continued to work out in the spring. He kept his options open in case he changed his mind about playing college football — advice he credits his parents for telling him. Gibson was certain about coming to Wabash. He attended multiple basketball games to watch family friend, Jesse Burgess '03, play for the Little Giants. Wabash eventually became the only school he visited. He will again experience the atmosphere first-hand on Saturday afternoons. He faces different challenges this year lining up on the opposite side of the ball. Gibson has taken notice of the benefits from playing safety last year. He can read defenses a lot easier when he sees the safety line up and he has a better understanding of the holes in the defense's scheme. Gibson is ready for the season to start Saturday. Wabash will take the field for the first time since losing in the quarterfinals to last year's national runner-up Mount Union. Gibson claims the loss has kept guys motivated. The first step in accomplishing the ultimate goal starts Saturday with a trip to Hanover.